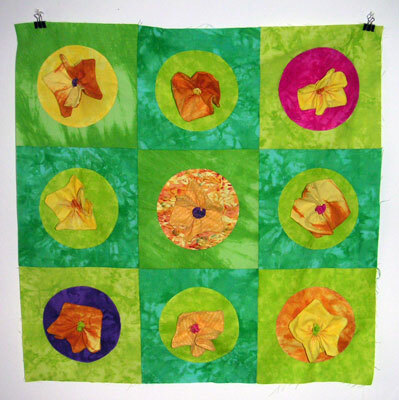 The design is fairly simple, but I really like the flowers because they were fun to make and add a great textural element to the quilt. The law school I was attending at the time is across the street from the Harold Washington Library in the Loop and the library had lots of quilting books. One book featured fabric folding and creating fabric flowers and so because my mom likes flowers, I wanted to make her a fabric garden. 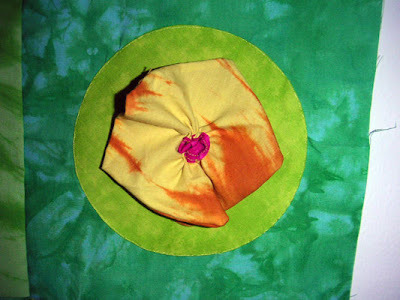 Plus, as I am remembering now, it was still winter (which means I made the quilt for mother's day) and it had been winter for something like 9 months, so I needed something spring-y. 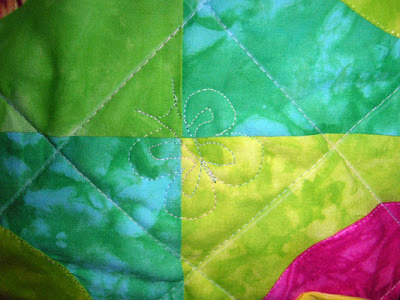 The quilt came together fairly quickly; it is a wall quilt and so quilting it was also fun and relatively easy.